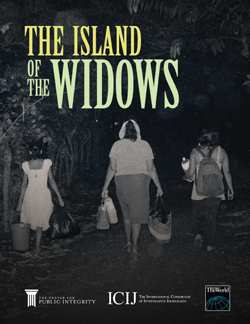 Click one of the below titles to view the project's e-book. The e-books are compatible with most tablet e-reader software. If you'd like to read offline, here are downloading directions for your iBooks (iPad and iPhone) or Kindle device. Be among the first to hear about any new e-book releases by subscribing to our Watchdog email newsletter. 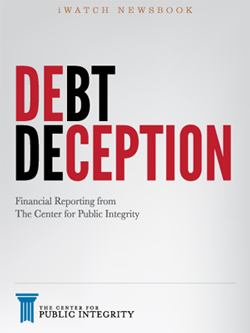 The following books from the Center for Public Integrity are available in print. In the wake of Hurricane Katrina, seven seasoned journalists traveled to New Orleans to investigate the storm’s aftermath. Through interviews with homeowners, first responders, politicians, evacuees, and ordinary citizens, the team explored the storm from every angle, including health care, social services, housing and insurance, and emergency preparedness. 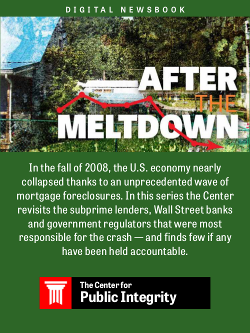 This comprehensive collection of expert voices uniquely details not only what went wrong in the Big Easy, but provides a road map to avoiding disaster in the future. This book is about more than just the mishandling of Katrina’s aftermath — it’s about how unprepared the government still is for the next disaster. Who owns the media in your town? How much do you know about the political agendas of the giant broadcasting, cable TV, and telephone companies that you rely on for news and information? To find the answers to these questions and more, read this in-depth resource about the broadcasting and telecommunications industries. Networks is a must-read for anyone who wants to “consider the source” of virtually all the news and information they consume every day. 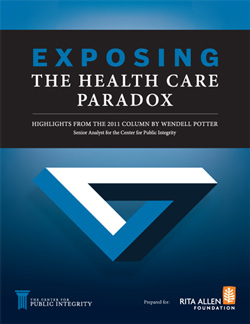 Written by the staff of the Center for Public Integrity, the book contains financial and political profiles of the top 41 communications conglomerates in the United States, in addition to detailed contribution information about the congressional committee members that oversee the industry. The Corruption Notebooks is a hard-hitting collection of essays by leading investigative journalists from around the world on what happens when the public is either uninformed about abuses of power or incapable of doing anything about it. Many of the 25 contributing journalists have been threatened, jailed, and in some cases had their offices firebombed. All have spent years fearlessly uncovering government and corporate scandal in their home countries. Their unique and comprehensive essays reveal how no democracy, including the United States, is immune from the scourge of corruption. 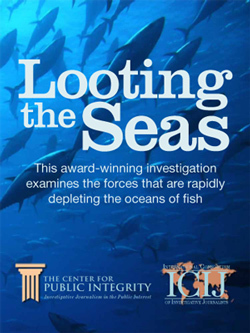 Published by the Center for Public Integrity, The Corruption Notebooks is essential for anyone seeking to understand the insidious impact of corruption on societies around the world. Harmful Error is the first-ever national examination of local prosecutors’ conduct in all types of criminal proceedings. The book reveals how local prosecutors in jurisdictions across the nation have stretched, bent, or broken rules to win convictions. 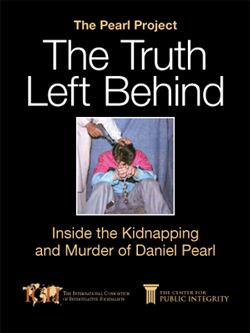 Pulitzer Prize-winning journalist Anthony Lewis applauded the book as “by far the best thing I have ever seen on or near the subject of prosecutorial misconduct. It is painful but essential reading.” Since 1970, individual judges and appellate court panels have cited prosecutorial misconduct as a factor when dismissing charges, reversing convictions, or reducing sentences in more than 2,000 cases. In thousands more, judges labeled prosecutorial behavior inappropriate, but upheld convictions using a doctrine called “harmless error.” The book shows how prosecutors’ misconduct led not only to the conviction of innocent individuals who were later exonerated, but also resulted in guilty defendants having their convictions overturned and being placed back on the street. Many of these prosecutors were cited multiple times for their misconduct. These prosecutors give recidivism — a word usually used to describe those they work to put behind bars — a disturbing new meaning. A New York Times bestseller, The Buying of the President 2004 reveals how the process of choosing a president has moved from the voting booth to the auction block, and shines a light on the special interests that heavily invest in the politicians who seek the nation’s highest office. Lewis and his team reveal and investigate the sponsors and the known and not-so-known conflicts of interest entangling each of the aspirants to the White House. This is the only book of its kind, containing investigative profiles and personal histories of the major presidential candidates. The privatization of public water systems around the world, driven by a handful of European corporations and the World Bank, is increasing dramatically despite sometimes tragic results. The Water Barons, by the International Consortium of Investigative Journalists, a project of the Center for Public Integrity, shows how the three largest water utility companies have expanded since 1990 into nearly every region of the world, raising concerns that a handful of private companies could soon control a large chunk of the world’s most vital resource. Amid the global military downsizing and the growth of small conflicts since the end of the Cold War, governments have turned increasingly to private military companies to intervene on their behalf around the globe. Making a Killing, by the International Consortium of Investigative Journalists, a project of the Center for Public Integrity, looks at over 90 companies now providing services normally performed by national military forces. These companies have operated in 110 countries worldwide. They provide everything from military training to logistics, and even engage in armed combat — and they have virtually no public oversight. 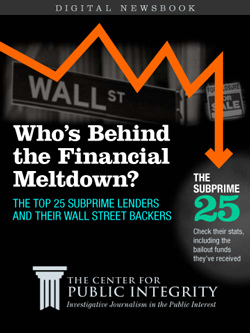 A scourge of legalized corruption is spreading through state capitols across the country. With little fear of exposure, vested interests have turned one statehouse after another into private preserves for their agendas, imperiling our health and safety, our wallets, our environment, and our rights as citizens in the process. Capitol Offenders, by Diane Renzulli and the Center for Public Integrity, is the first investigative book to expose the close ties between state lawmakers and large industries, documenting the fusion of public service and private interests. Each year, millions of income-earning adults and corporations do not pay their fair share of federal income taxes — whether legally (tax avoidance), illegally (tax evasion), or through shady means (tax “avoision”), and their numbers are rising dramatically. 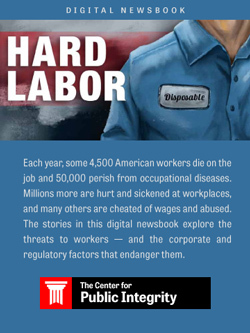 In this explosive book, Charles Lewis, founder of the Center for Public Integrity, and Bill Allison, a former researcher at the Philadelphia Inquirer, expose the worst of these white-collar culprits and explain how they can be stopped. Published by Common Courage Press, this book is a hands-on, practical guide to being an effective muckraker, detailing methods used by investigative reporters to uncover and address the ethical lapses of corporate and government groups that affect even small communities. The narrative also includes case histories in which one person or community illuminated the damaging truths behind corrupt powerbrokers, with inspiring results. 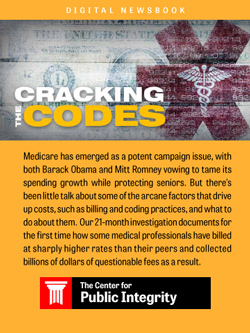 Twenty-four researchers, writers, and editors worked for 18 months to page through tens of thousands of federal and state records, thousands of news articles, and hundreds of interviews to create this definitive book. 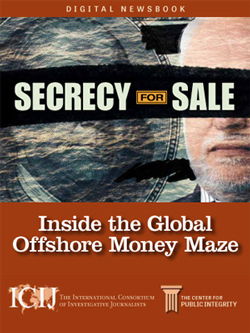 It is the only investigative book about the 2000 presidential candidates. 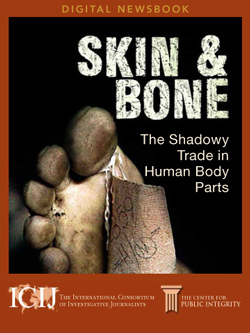 Written by Alan Green and the Center for Public Integrity, and published by Public Affairs, this book collects four years of unprecedented research into the exotic animal trade in the United States and exposes the underground trade in rare and endangered animals. Animal Underworld documents how these creatures are moved from respected zoological parks and research institutions through a network of shady, but often federally licensed, dealers to private pet owners, roadside attractions, and even “canned hunts” — and tells you why more is not being done to stop it. Read a preview here. The United States Congress is supposed to work for you. So think of this book as the most important employee evaluation you’ll ever read. 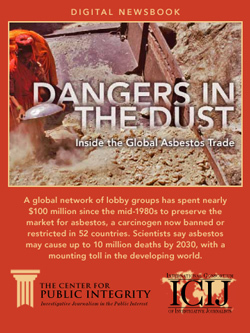 A startling and groundbreaking expose, The Buying of the Congress details the ways in which special interests worm themselves into the lives of Capitol Hill lawmakers — who in turn protect polluters, cigarette manufacturers, food producers, the airline industry, the insurance industry, corporate tax cheats, and other big-money interests. What does all this have to do with you? You cannot shop at the local supermarket or drugstore, visit a hospital emergency room, watch television, pay your taxes, or even breathe the air outside your home without being directly affected by the decisions that Congress makes — decisions that, increasingly, favor special interests at your expense. Now, Charles Lewis and the Center for Public Integrity reveal just how and why Congress has been so unresponsive to the basic concerns of ordinary citizens. Based on the work of an investigative team of more than three dozen people, the conclusions they reach are simple — and simply frightening. This guide to the big money sources behind the presidential candidates features hard-hitting facts culled from public records, detailed pie charts, and easily referenced top-ten lists of financial supporters for all the candidates who were part of the 1996 presidential campaign. Toxic pollution has increased dramatically in the 37 years since the publication of Rachel Carson’s seminal Silent Spring, and the chemical industry has become infinitely more sophisticated at deploying legions of lobbyists, lawyers, scientists, and public relations experts who camouflage its deadly deceptions. 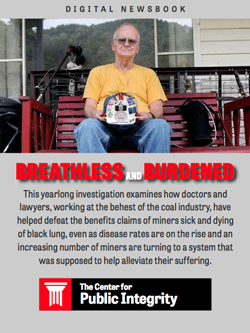 Two prize-winning investigative reporters have dug deep into the secretive world of the nation’s chemical giants and unearthed enough wrongdoing to shake America’s faith in many of the products of our homes. 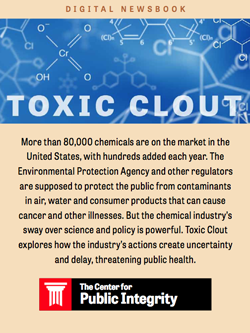 Yet rather than merely exposing the injustices of the chemical industry, Toxic Deception offers an optimistic vision of how consumers can reduce their own risk and how a flawed system of health and safety laws can be rescued through practical reforms. Subtitled “Where Have All the Members Gone?” this book by Rebecca Borders and C.C. Dockery shows the great consideration given by members of Congress on what it means to seek power, to exercise it (or attempt to), and finally to lose it or give it up. The following reports from the Center for Public Integrity are available in PDF format. Where to stay in the nation's capital? If you're one of the Democratic Party's big donors or fund-raisers, your hotel of choice isn't the Four Seasons or the Ritz-Carlton. It's the White House. 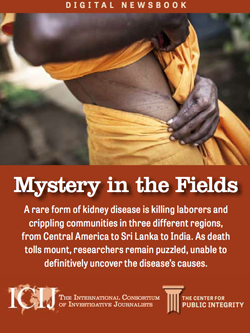 A collection of 10 investigative reports by journalists from across the globe. 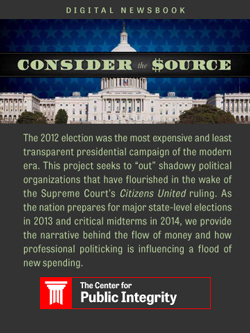 An examination of Section 527 soft money groups and the role they played in the 2000 elections. A state-by-state analysis of lawmakers’ conflicts of interest, based on their sources of income and assets, committee assignments, leadership positions, and legislative duties. Off the Record reveals that the giant media corporations of today are little different from any other special interest. They make campaign contributions. They lobby. They pay for junkets. And more often than not, they get exactly what they want, which is why the media is widely regarded as the most powerful special interest in Washington. This, the third of the “Congress and the People” studies, explores the potential dangers associated with pesticide use and analyzes why lax regulation of these dangerous products continues to exist. Among other things, the study shows how the pesticide industry is seeking to weaken the Food Quality Protection Act. The second of the “Congress and the People” studies, this explores the money and perks given by Democrats, Republicans, and members of the FAA and the safety issues that as neglected, as a result. This report is the first of four “Congress and the People” studies. Congress consistently has ignored growing threats to the public health posed by the slaughter and meatpacking industries, meat producers, and distributors. Over the preceding decade, the food industry contributed $41 million to the campaigns of members of Congress, who obliged by blocking every bill that promised meaningful improvement. This study, written by Patrick J. Kiger and investigated by John Kruger, is an analysis of the forces behind the U.S. economic embargo against Cuba, particularly the Cuban American National Foundation. Findings include the fact that Senator Robert Torricelli, Democrat of New Jersey, completely reversed his position on Cuba after receiving $120,000 from directors and trustees of CANF and the Free Cuba PAC. This report identifies the paid and unpaid advisors to all the major presidential candidates, from lawyers and lobbyists to spin-doctors and even shadier cohorts. As an outstanding example, the Center discovered that the co-chairman of Pat Buchanan’s campaign, Larry Pratt, taught white suprefmacist groups how to develop militia capabilities. The Associated Press issued an “Urgent” bulletin about this information. Within two hours of the Center’s Washington news conference, reached in New Hampshire by CNN, Buchanan removed Pratt from his campaign. This was the top story in the U.S. for one day. Written by Meredith O’Brien, this report documents the gambling industry’s extensive ties to the two major political parties and to Bill Clinton and Bob Dole, 1996’s two presidential nominees. Since 1991, gambling interests poured more than $4.5 million into campaigns for the White House and Congress and into the soft-money accounts of the Democratic and Republican Parties. This study examines the U.S. Forest Service under the Clinton administration and its relationship to Congress and the private sector. Written by Steven T. Taylor, the report is based on extensive field research in Alaska, Colorado, California, and Washington, D.C.
Kevin Chaffee updates a March 1991 study which found that since 1979, 112 former members of Congress used an estimated $10.5 million in unspent campaign donations for non-election-related purposes. This study is based upon Federal Election Commission records of more than 200 members of Congress who left office between 1979 and 1993. Researched and written by 17 researchers who examined the Washington lobbying activities of 660 interest groups for over a year, this study is regarded as the only authoritative guide to health care lobbying with regards to the 1993-94 Clinton health care reform legislation. This study is praised by the Columbia Journalism Review as the definitive investigation into lobbying for and against NAFTA. The Center found that the Mexican government and business interests waged the largest foreign lobbying campaign in the United States, spending at least $30 million to promote the development and enactment of NAFTA. Besides hiring a phalanx of Washington law firms, lobbyists, public relations companies, and consultants, Mexican interests took 83 Congressional staff members on all-expense-paid trips to Mexico. This Center study, by Seth Shulman, explores the U.S. Army’s Biological Defense Research Program (BDRP) and finds the program misguided in its aims and poorly managed. It deems the problems so extreme as to suggest that the BDRP research may actually undermine efforts to control and protect against the heinous threat of biological warfare. Written by Encarnacion Pyle, this report begins with a 1965 Lyndon Johnson Executive Order requiring federal government contractors to abide by certain “equal opportunity” standards. The Center finds that a quarter century later, an extraordinarily low number of women and minorities – two percent or less -are employed in the upper management ranks of the 20 largest defense contractors. Steve Weinberg investigates the practice in which former U.S. officials take classified documents with them after leaving public service, use the materials to write lucrative memoirs, and then seal off these documents for decades from historians, journalists, and other researchers. The Center finds that former Secretary of Defense Caspar Weinberger locked up 1,700 pages of personal notes at the Library of Congress, sealed away from the public, the General Accounting Office and, at least initially, federal prosecutors. Pamela Brogan’s examination of 10 major U.S. foreign aid recipients, all associated with serious human rights abuses, that pay Washington lobbyists to press Congress for increased aid. This report, by Stephanie Epstein, finds that taxpayer-supported, high-tech university laboratory research is being sold for a song to Japanese and other non-U.S. corporations. Kevin Chaffee’s March 1991 study which found that since 1979, 73 former members of Congress used an estimated $6.4 million in unspent campaign donations for what were, in most cases, non-election-related purposes. This study is based upon Federal Election Commission records of more than 200 members of Congress who left office between 1979 and 1991. This study, by Jacqueline Sharkey, examines the controversies surrounding restrictions on the media during the Gulf War and two major U.S. offensive military operations in the 1980s: the invasions of Grenada and Panama. This Center report, by Jean Cobb, documents a number of cases in which it appears that money was a factor in the way members voted on specific pieces of legislation or amendments. In addition, it illustrates how these votes are hurting taxpayers and consumers through lost revenue and higher prices. 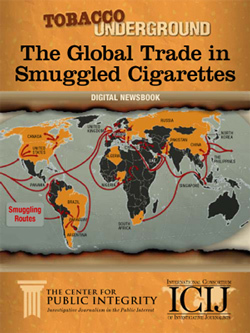 America’s Frontline Trade Officials, the Center’s first study, was released at a National Press Club news conference. The report prompts a Justice Department ruling, a General Accounting Office report, a Congressional hearing, is cited by four presidential candidates in 1992, and is partly responsible for an Executive Order in January 1993 by President Clinton, placing a lifetime ban on foreign lobbying by White House trade officials.